For Joe Panepinto and Hartz Mountain, revitalizing Journal Square, and opening 3 Journal Square, has been a 38-year-long project. Panepinto and its venture partner, Hartz Mountain, had originally intended to create office space at 3 Journal Square, but changed their aspirations six years ago. 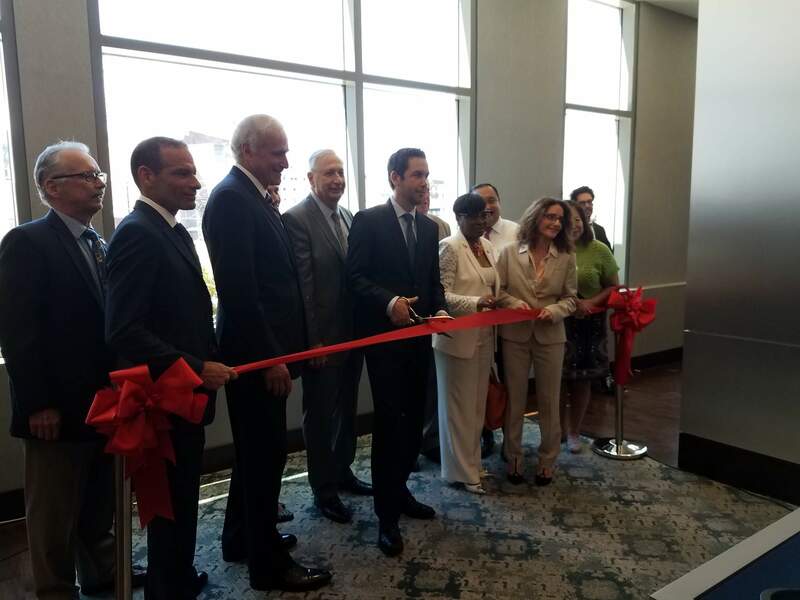 On Tuesday, the developers hosted members of the state Economic Development Authority and the Jersey City administration at the official opening of its 240-unit luxury complex at 2395 JFK Blvd. “This doesn’t happen easily,” Gus Milano, president of Hartz Mountain, said. “This was basically pioneers, coming to Journal Square. Jersey City Mayor Steve Fulop cut the ribbon at the property and thanked the developers for believing in his and the city’s vision for Journal Square. Greystar Property Management said the 13-story building is 40 percent occupied and is expected to reach full occupancy by September of this year. Marchetto Higgins Stieve worked alongside interior designer Childs Dreyfus Group to bring the LEED Silver project to life. “There’s an atmosphere here that appeals to a cross-section of people, and we’ve enhanced that with a building that promotes a modern living experience,” Milano said. 3 Journal Square was the recipient of an Urban Transit Hub tax credit and a tax abatement from the city. The property features 240 studio, one-, two- and three-bedroom units across 12 floors and a penthouse level. Pricing starts at $1,900. “Found throughout the floor plans are designer finishes, including chestnut wood vinyl flooring, kitchens with granite countertops and stainless-steel Energy Star appliances, quartz bathroom countertops and full washer and dryer,” the firms said. “Select apartments offer magnificent New York City views. “Residents have access to a 24-hour concierge and maintenance, a state-of-the-art health and fitness center, yoga studio with virtual fitness classes, resident lounge with fireplace and billiards, party room, and a wired conference room. Panepinto Fine Art supplied art pieces for the building’s common areas. Three Journal Square is located steps from the Journal Square PATH station and KRE Group’s ongoing Journal Squared project. Fulop said he expects the neighborhood to continue to grow because of the contribution of developers like Hartz and Panepinto. “We’re working to get the theater back,” He said. “We’re working with the county to acquire the Pathside Building, which will be the new home to the Jersey City Museum, 60,000 square feet.